The reason I said this is because I wanted to knit one. She said a lace shawl would be acceptable. 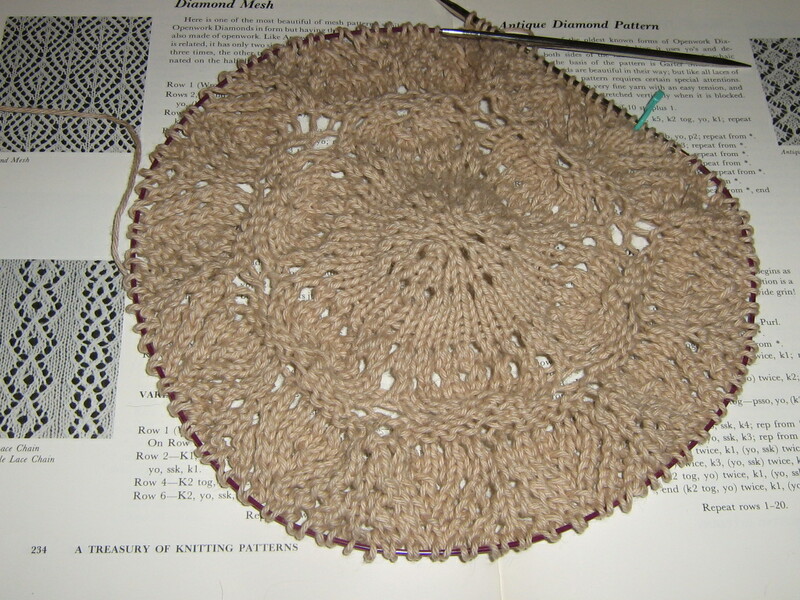 Provided it was knit in cotton/linen, and the color was tan or taupe. …Taupe? You’ve gotta be kidding me. Whatever. KnitPicks CotLin in Linen it is. She didn’t give me any suggestions as to a pattern, either, so she’s getting a Pi Shawl, filled with whatever lace patterns I feel like knitting. I used Judy’s Magic Cast-On for the center because I didn’t feel like wrestling against this slippery yarn to do a nice circular cast-on. I guess it looks okay. My mom most likely won’t notice the difference. If she doesn’t wear it, well… I wash my hands of it. I think that’s the worst possible color for a shawl (correct me if I’m wrong), but it’s what she wanted, so even if she doesn’t wear it (and who could blame her) I expect some effing gratitude.